You're priced at a mere $374. That seems pretty inexpensive for an A-list Face Chair. It's not about the money for me. It's like when Real Ryan Gosling made Blue Valentine -- I am the Blue Valentine of living room decor. Hey, don't typecast yourself -- you'd look great in a breakfast nook too. I like burritos with eggs in them. Who doesn't? So, how do you feel about your Bentwood inspiration? It's interesting. 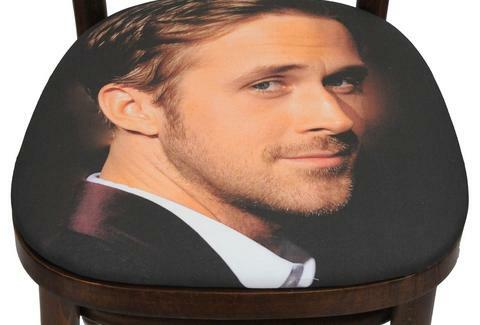 I think the mid-century was probably ready for chairs, but it wasn't ready for Ryan Gosling's Face. Then again, is any century? Maybe the 24th Century. Is there any Face Chair you were particularly inspired by? I'd have to say Early Career Mickey Roarke Face Chair. It always looked like it was just about to break apart, but it never did, and when you dragged it, instead of squeaking it would make this brilliant mumbling sound. Also it seemed taller than it actually was. Your own career's been pretty hot lately. Is there anything that bothers you about fame? A lot of people, they just stare at me, and never sit down. It's like, I'm a chair. That's my craft. That's what I do. Don't be superficial. Sit on me. A guy's about to use you in a bar fight. What's your advice? Don't swing me. Just grip me loosely like you might swing me, but keep smiling. It's all about throwing people off balance. One last question: Does it bother you that you don't have arms and can't do the Dirty Dancing full-extension move? Does it bother you that you do have arms and can't do the Dirty Dancing full-extension move?